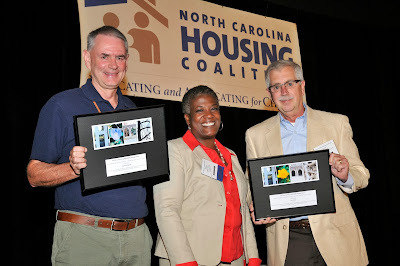 The North Carolina Housing Coalition (NCHC) recently honored Lew Kraus, Executive Director of Asheville Area Habitat for Humanity, with the Bill Rowe Service to Affordable Housing Award for his outstanding work and leadership in affordable housing. Kraus was a volunteer with Asheville Area Habitat for Humanity when it incorporated in 1983 under the name of Western North Carolina Habitat for Humanity, making it the first Habitat affiliate in North Carolina. In 1988, Lew became Asheville Area Habitat’s first executive director. Now in his 25th year in this role, he is the longest-serving executive director of any Habitat for Humanity affiliate! With an unwavering commitment to the vision of a safe and decent home for every family, Lew’s passion, strong leadership, and strategic thinking has provided 250 families the opportunity to own a home and has made Asheville a model Habitat affiliate. The award was presented to Kraus during the recent NC Affordable Housing Conference in Raleigh, NC. 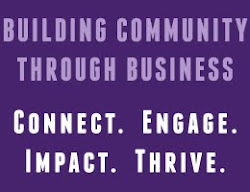 Over 900 people attended the conference from across the state including housing advocates, bankers, for-profit and nonprofit developers, community development corporations, local and state government officials and others from the many businesses and organizations that finance, build, and operate affordable housing in NC. Kevin Campbell, Executive Director of Habitat for Humanity of Wake County also received a Bill Rowe Service to Affordable Housing Award. The Steven Whitesell Housing Professional of the Year Award was given to Freda Taylor of the Arc of North Carolina, and the Public Official of the Year Award went to Representative David Lewis. “Each of these leaders is a tremendous example of the great network of organizations and individuals who are working hard every day to produce more quality affordable housing in NC,” said Satana Deberry, NCHC Executive Director.